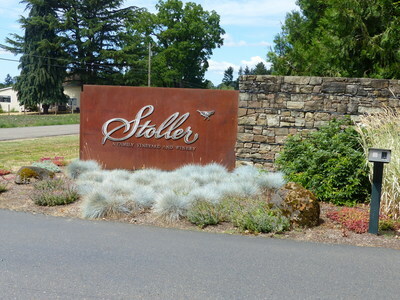 A sign marks the entrance to the Stoller Family Estate winery in Dayton, Oregon. This image was taken during an oral history interview with Bill Stoller on July 10, 2017. Stoller was interviewed by Linfield College archivist Rich Schmidt. Linfield College Archives, "Bill Stoller Interview 13" (2017). Browse All Willamette Valley Oral History Interview Photos. Image. Submission 374.